Sorry, but another late post. The hot sun on the last weekend of half term made me forget to do the guide, until now that is…. Some cracking Science TV and Radio next week, including a documentary on Radium, In Our Time discussing Relativity (one for my A2 classes), a new series of Food Unwrapped on Channel 4, and find out how Africa was formed in Rise of the Continents on Sunday. I saw this lovely little video on synchronous caterpillar motion yesterday by Destin at SmarterEveryDay and I thought I should share it; contains Lego(s). 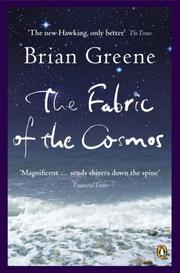 The Fabric of the Cosmos by Brian Greene explorers the nature of space and time and how the structure of the universe is tied into these two interwoven concepts. Topics range from the latest developments in superstring and M theory, to time travel and quantum teleportation; from Newton’s ideas of a clockwork universe through Einstein’s theories of general relativity to quantum mechanics and the arrow of time.